A great combination of honey-hued woven natural rattan and our steel-bodied, hand-painted enamelware. This handled Parchment CheckTM Rattan & Enamel Party Tray is big enough for breakfast in bed or a garden party. As handy as it is handsome, this entertaining tray is perfect for year-round use and just the excuse you need to host a long-overdue get-together. 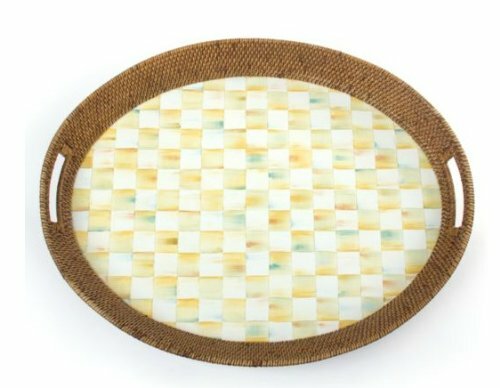 Materials: Heavy-gauge steel tray base hand-painted with checks and ceramic glaze, rimmed in hand-woven rattan. Hand-wash with mild soap and dry immediately. Pieces may vary due to the handmade nature of each product. Imported. Our enamelware exceeds both federal food safety regulations and California's Proposition 65, the strictest environmental safety standards in the U.S. Handle enamelware with care, and discontinue use for food service if it becomes chipped, cracked, or broken. If you have any questions about this product by MacKenzie-Childs, contact us by completing and submitting the form below. If you are looking for a specif part number, please include it with your message.